Prime Minister Narendra Modi has catapulted the image of India to a sky level in front of the world. With his futuristic efforts, he has conquered the hearts of people across the globe. But have you heard that a little effort by a common man will make international personality a fan of yours? Have a look at this story of a common man. As we all know his Swachh Bharat Abhiyan is an attempt to clean up cities and villages and it is heartening to see when people participate and genuinely help out in the effort. Apart from the government, common citizens too should take part in the movement and help spread awareness. Akash Jain, a young entrepreneur from Bengaluru took to Twitter to share a picture of his sister’s wedding card. What is special about this card is that it has the logo of Swachh Bharat on it! Bengaluru’s Akash Jain, who is an ardent follower of Modi, printed a special ‘Swachch Bharat’ awareness message on his sister’s wedding invitation card and tweeted a picture of the same to PM. It’s a small gesture by Akash’s family but it makes sure that the message of Swachh Bharat will reach as many people as possible. As our PM is very active on social media, this post in no time drew his attention and what he did was so super special, that this twitter user wouldn’t have expected. PM Modi re-tweeted his post and started following him. Yes, it actually happened and that guy is on cloud 9. 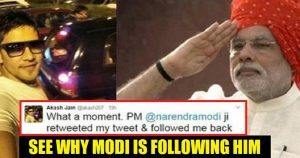 Yes, Narendra Modi was so impressed by Akash’s effort that he retweeted his Tweet and even started FOLLOWING him on Twitter. And all these happened because of one positive initiative Akash’s family took a few days ago to put the “Swachh Bharat ” logo on the wedding card of his sister. But this small effort made by Akash and acknowledged by Narendra Modi kind gesture would certainly leave the positive impact on people. We have to realize that small actions are not really small. They create a huge impact! And I am glad that Narendra Modi is appreciating the efforts of a common man! What do you say about this? Let us know your views in the comments section below.